Test outputs available: 0 to100 amperes a.c., 0 to 240 volts a.c., 0 to 240 volts d.c.
Auxiliary output 0 to 120 volts a.c. for directional relays. Panel with clear easy to follow legend. Built in Timer system for testing IDMT relays or circuit breakers. Overload protected against current and thermal overload. Digital readouts of current, voltage and time. Protective devices such as relays, overload coils and circuit breakers should be checked on installation and at regular intervals when in service. Routinecurrent injection tests will quickly detect faulty or incorrectly adjusted device. The 'UDEY SC-10' is suitable for all these applications including protective relays, including IDMT relays. Beside schecking the correct functioning of the protective device, it is usually necessary to measure the operating time. 'UDEY SC-10' has a built in timer to measure the operating time. 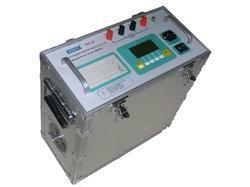 The 'UDEY SC-10' secondary current injector is a tester with rating of 100 Amp -1.8 kVA with built intimer. 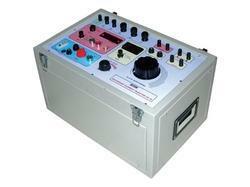 This will test instantaneous relays, IDMTrelays, directional relays, moulded circuit breakersand meters. Current or voltage at each of the four main sets of a.c. terminals is continuously variable. 0 to 100 A a.c. or 0 to 24 V a.c.
0 to 30 A a.c. or 0 to 80 V a.c.
0 to 10 A a.c. or 0 to 240 V a.c.
Output current flowing thru the common terminal is measured to a resolution of 10 mA. Also a variable output of 0 to 240 V d.c. and an independently controlled output of 0 to 120 V a.c. is available to allow testing of directional relays. Two digital displays are used. A 3½ digit display to show the output current or voltage (by means of meter range selector switch). The other is a four digit display to show readings of the timer. A 'SET/TEST' switch is provided so that the appropriate current can be setup before the test is actually carried out, and to avoid damage to relay coils by disconnecting the test current after the device has operated. The timer has custom operating modes: 'NO', 'NC','CUR' 'RUNBACK' and 'MANUAL'. These enable the function of a protective relay to be fully tested.Separate terminals are provided for connecting to the tripping contacts of the relay. The timer has 'RESET' pushbutton and two manual pushbuttons. Measure DC resistance of transformers windings etc. Introduction: The UDEY 'TRT-27 is a high precision, new generation, light weight large output current and micro-processor controlled tester. This replaces old DC wheat stone bridge and double arm bridge for measurement of DC resistance. 'TRT-27' adopts new advanced test current power supply technology, four terminal measurement, digital display of resistance value and test current. 'TRT-27' is powered by 220V AC mains single phase supply. The measurements are accurate as the test current is highly stable. High automation is achieved with automatic discharge warning. Principle: The constant current generated is fed to the resistance under test through the current terminalsand the voltage drop across the resistance under test is measured and displayed in ohms. A true four terminal measurement is used to eliminate the need for lead resistance compensation. Description: UDEY 'TRT-27' is a new generation, digital resistance meter using 4 terminal measurement technique. Built in printer for printing results. The entire test is done quickly. 'TRT-27' generates constant current, powers up the test current, takes the readings, and displays the results on the LCD screen. The 'TRT-27' is encased in an aluminum alloy cabinet. Flexible testing cable set with alligator clamps. 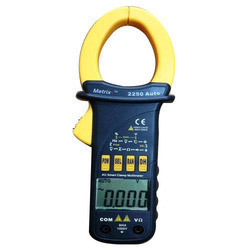 Looking for Digital Clamp Power Meter ?